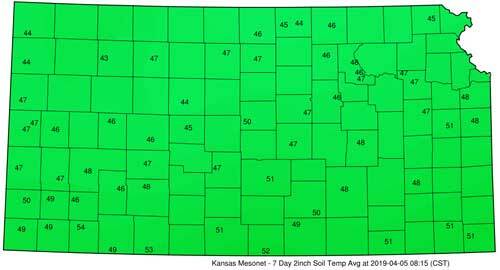 For the week of March 30 to April 5, average weekly soil temperatures at 2 inches among crop reporting districts overall ranged from 45 to 53 degrees F (Figure 1). For example, in the northeast region, soil temperatures ranged from 45 to 47 degrees F; while in the southwest region, soil temperatures varied from 53 to 47 degrees F (Figure 1). 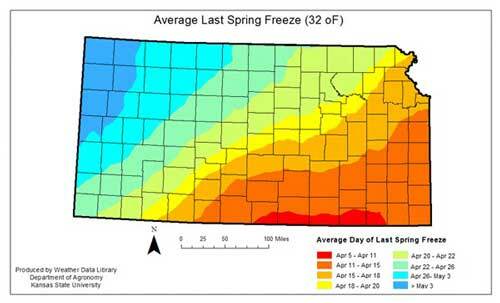 Soil temperatures were around 44-47 degrees F for the northwest region. 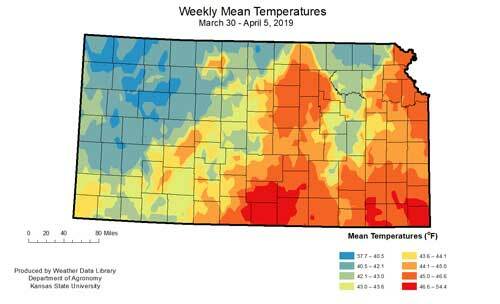 Differences in soil temperature were related to the large variations in air temperatures experienced last week, from 38 degrees F in northern portions of the state to 58 degrees F for areas in southern Kansas (Figure 2). Figure 2. Weekly mean air temperatures for the week of March 30 - April 5, 2019. Projections for the coming weeks are for increasing air temperatures – but cooler-than-normal state wind, which will slow soil temperature increases (Figure 3). Figure 3. 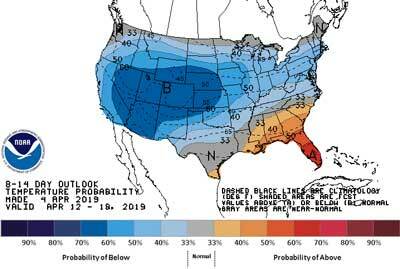 8 - 14 day outlook temperature probability for April 12-18, 2018 (NOAA). Current soil moisture status across Kansas is quite wet, despite the relative low precipitation for the week (Figure 4). If saturation is above 50% at the 2-inch soil depth, this reflects wet soil conditions with a low probability for field work. 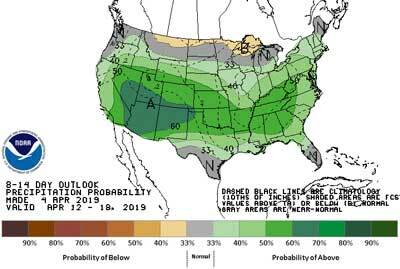 Projections for coming weeks are for precipitation to be above-normal for all of Kansas (Figure 5), which will slow down soil warming and impact potential plans for an early start to planting. Figure 4. 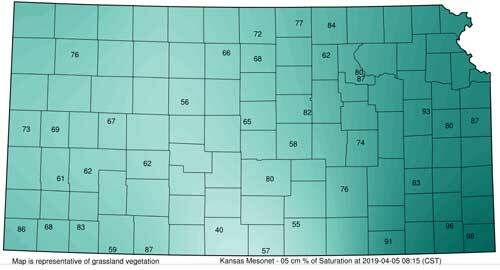 Percent saturation at 2 inches as of April 5-2019 (KS Mesonet). Figure 5. 8-14 Day outlook precipitation probability for April 12 - 18. (NOAA). This page generated in 0.01782 seconds.